Handymans Corner has been a local supplier of paints, tools and even ironmongery to Brixton trades and residents for decades. The firm’s family ethos and understanding of what people really need made them a perfect fit for Brewers. So in 2014 we became part of the Brewers family. 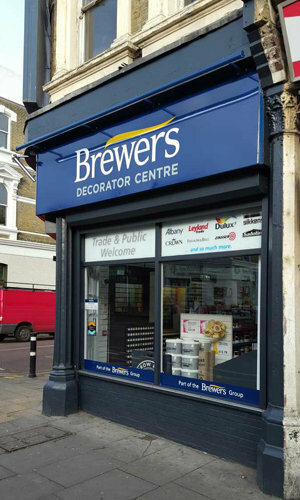 Now a Brewers Decorator Centre, we’ve retained both shops and the tools and ironmongery specialism, as well as adding a much larger choice of trade and designer paints. You can borrow wallpaper pattern books, have free delivery and ask our highly experienced team for any decorating tips and product guidance. Our shops is on the corner of Acre Lane – the A2217 between Clapham Common and Brixton – and Solon Road. From Brixton Hill on to Acre Lane, continue on until the junction with Solon Road and Branksome Road. From the Abbeville Road on to Acre Lane, continue on until the junction with Solon Road and Branksome Road.